Yes, we know it’s bated, not baited. 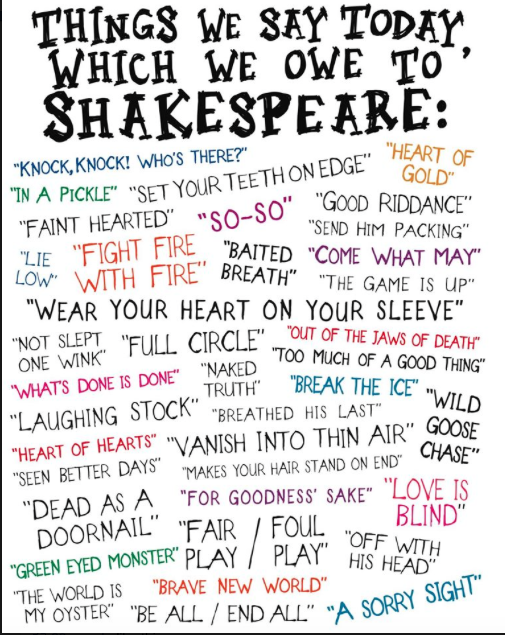 The impact that Shakespeare had on the English language was huge and the above phrases were used for the first time by the Bard from Stratford-upon-Avon. According to Shakespeare online (about which I know nothing), he invented more than “1,700 of our common words by changing nouns into verbs, changing verbs into adjectives, connecting words never before used together, adding prefixes and suffixes, and devising words wholly original.” You can check them out here. One of my favs, “If you get my drift,” isn’t above. Add any others that are missing and/or your favorites to the list.